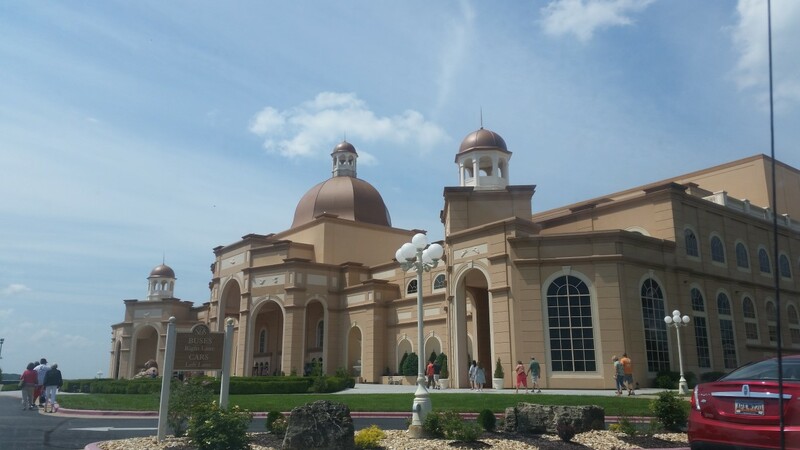 Thursday, July 20, 2017 – Tuesday night we enjoyed the musical production of “MOSES” at Sight & Sound Theater in Branson, MO. 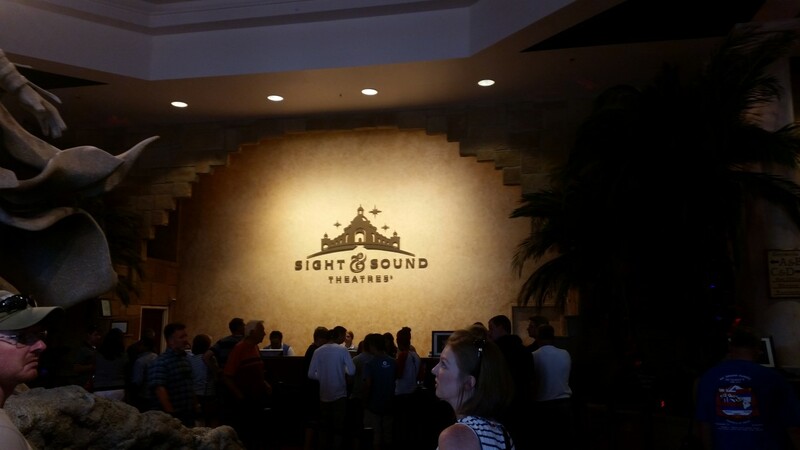 We’ve seen two other Sight & Sound productions in years past and as always this was a high quality show! 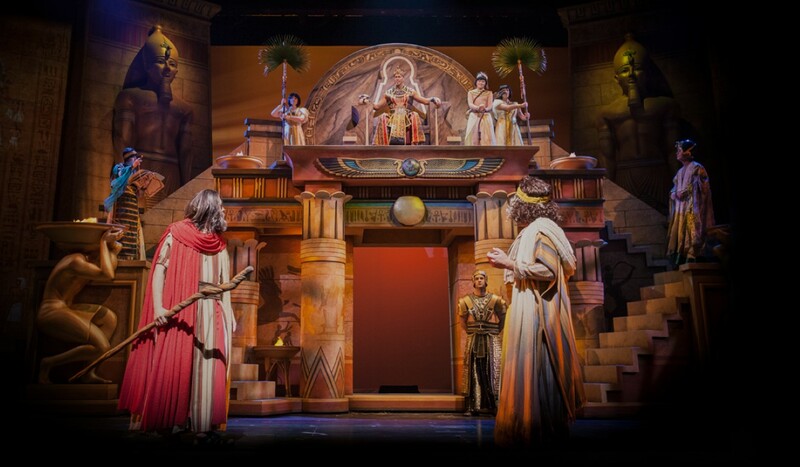 They tell spectacular Bible stories, brought to life on a panoramic stage. 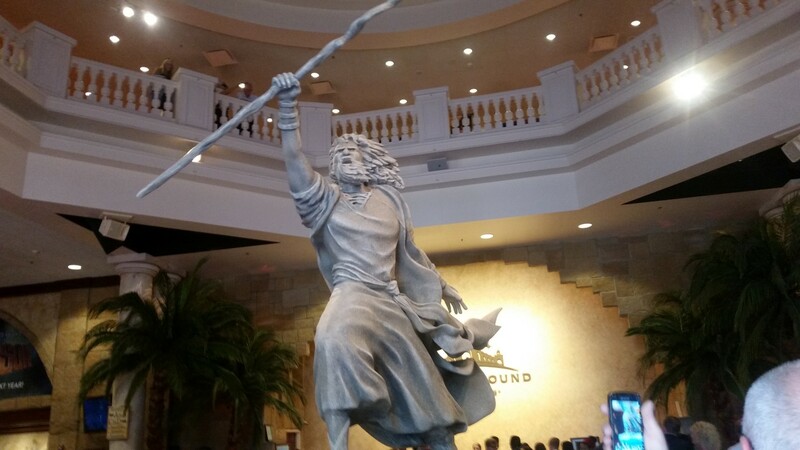 Sight & Sound takes theater to a whole new level. Every show is an epic experience with a meaningful message. Where edge-of-your-seat action meets heartfelt drama. 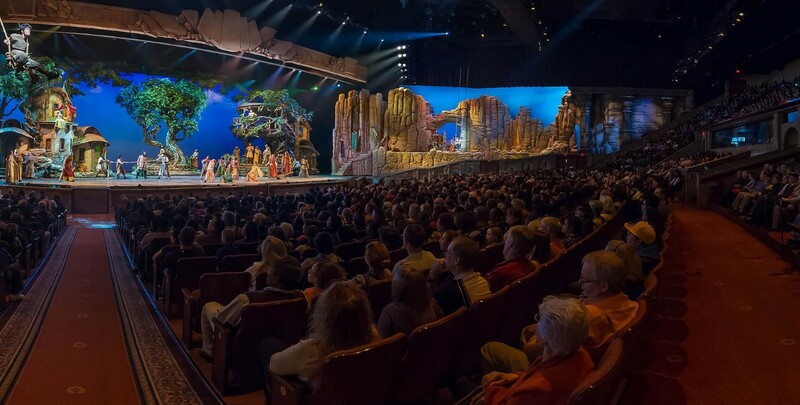 Sight & Sound’s unique theater experience begins with a 2,000 seat auditorium, a 300-ft stage that surrounds the audience on three sides, state-of-the-art technology and live animals. 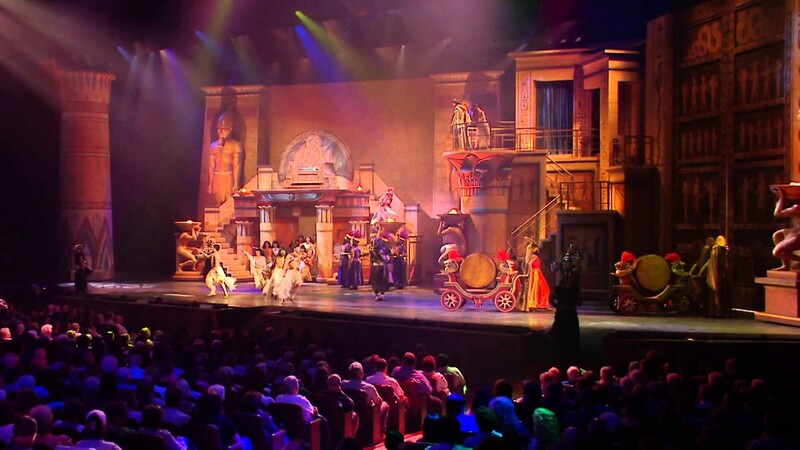 Each production is intricately created—from the finely-stitched costumes to the grand staging of massive sets. Meticulous attention is given to every detail as they magnificently come together to transport you right into the heart of the story. The singing part of the play was so outstanding I don’t have a word for it! 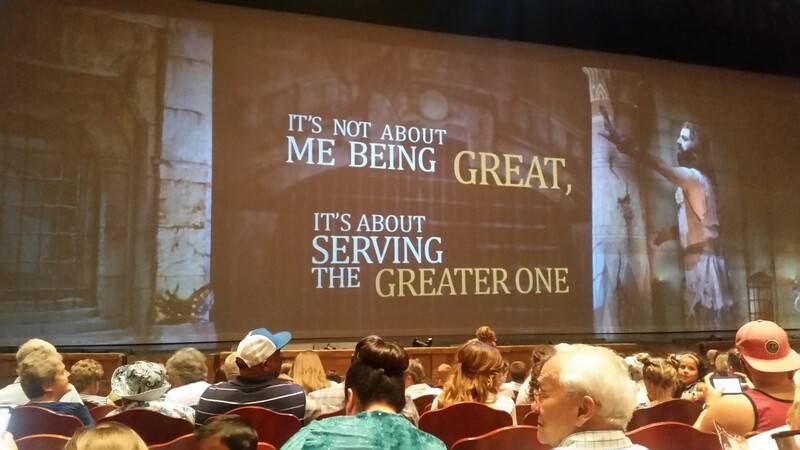 Our purpose is to present the Gospel of Jesus Christ and sow the Word of God into the lives of customers, guests and fellow workers by visualizing and dramatizing the scriptures, through inspirational productions, encouraging others and seeking always to be dedicated and wise stewards of our God-given talents and resources. They do not allow photos or videos to be taken during the production so most of what I have below were grabbed from the internet. If you ever have the opportunity to attend one of the spectacular productions, jump on it!! It’s not cheap but when you leave at the end you are glad you paid what you did for the opportunity to be so blessed! 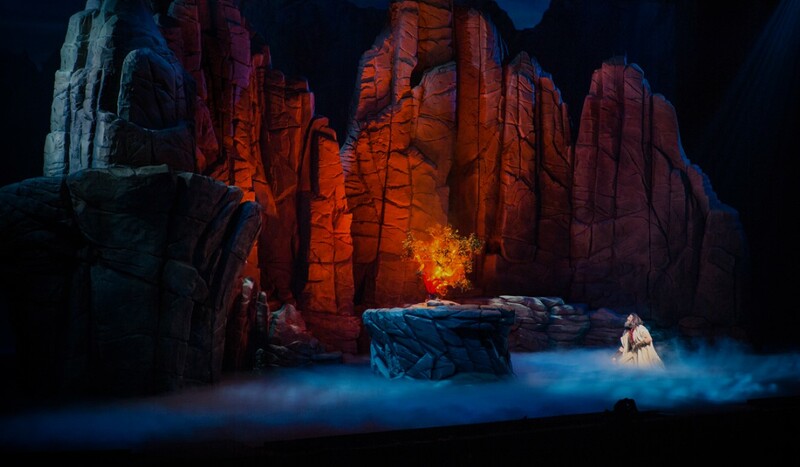 This scene of God speaking to Moses at the burning bush was phenomenal! 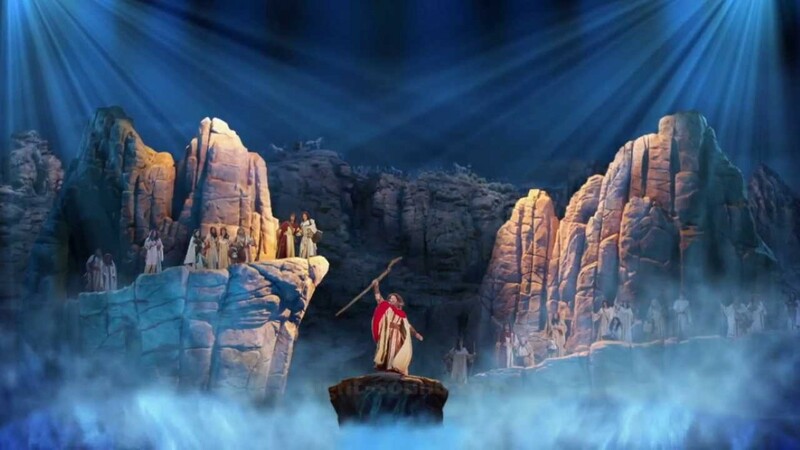 The scenery is so big and so real looking that when the voice of God spoke to Moses it felt like we were really there when it actually happened! None of these photos show the scenery on the sides of the auditorium or the animals, soldiers, other actors using the aisles as part of the stage and flying in from the air! You also don’t see the non-human actors includes cattle, sheep, goats, dogs, parrots, a rat, a skunk, camels, horses and donkeys. Even though the story of Moses takes place in the Old Testament, Jesus does indeed make an appearance. It’s all amazing! 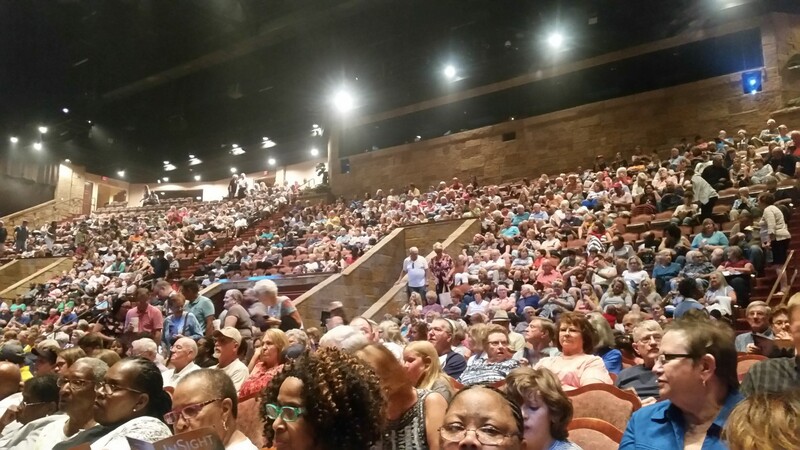 We just went to Dixie Stampede this evening so I’ll be sharing all that soon, along with what we saw at Ralph Foster’s Museum and the Keeter Center at College of the Ozarks! We will be here through next Wednesday so who knows what all we’ll get into before then!! < 07.18.17 College of the Ozarks – Hard Work U – What’s it about?